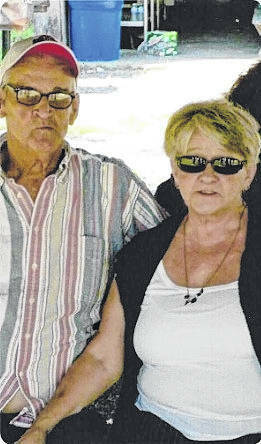 Mr. and Mrs. Clyde and Carole Fitch of Cheshire celebrated their 50th wedding anniversary on March 3. A dinner and cake was served by their children and grandchildren. Clyde is the son of the late Noah and Margaret Fitch. Carole is the daughter of the late Bill and Lilly Mae Oxyer. The couple was married on March 3, 1968 by Rev. Bud Darst in Cheshire. They have three daughters, Carole Lee Smith, Cheryl Johnson (Levi DePerow), and Candace (Andrew) Morrison, all of Cheshire; grandchildren, Jonathan (Hailey) Gaus of Rutland, Brittany (Chris) Burd of Gallipolis, Tyler (Chelsey) Gaus, Mikey Johnson, Brooklyn Sizemore, and Braxton Morrison of Cheshire; one deceased grandson, Derrick Johnson; a great-granddaughter, Kailyn Rife; great-grandson, Chayton Burd; step great grandson, Branton Burd; step great granddaughters, Madison and Adrienne Burd of Gallipolis. Clyde is retired from Roofers Local 185 and Carole is retired from Family Dollar.